Now that you all had a good laugh at my new hairdo (I was laughing so hard for five minutes, I could barely breath), I would like to emphasize that it was my decision to leave the short cut hair be, and cut the rest of the head in normal fashion (Jerry, you are right: I am a trendsetter). Don't think for one second E! would send me out into the world like this without my consent. We hung the few sheets of drywall we had left. 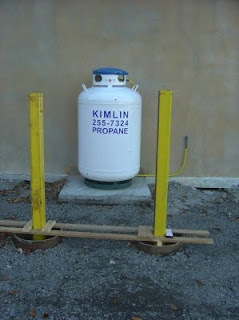 I ordered more last Friday, but we may not get it before Tuesday, which is fine as the weather is supposed to be gorgeous for the next two days so that we can do a few more outdoor projects, like setting the propane tank barriers.